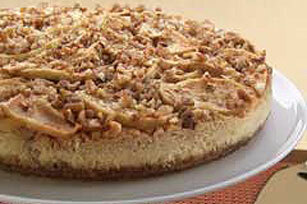 This rich, creamy cheesecake is topped with the sort of apple-pecan deliciousness you might find in your favorite pie. Combine crumbs, 1/2 cup nuts, 3 Tbsp. sugar, 1/2 tsp. cinnamon and butter; press onto bottom of 9-inch springform pan. Bake 10 min. Beat cream cheese, 1/2 cup sugar and vanilla in large bowl with mixer until blended. Add eggs, 1 at a time, mixing on low speed after each just until blended. Pour over crust. Combine 1/3 cup sugar and remaining cinnamon. Sprinkle over apples in separate large bowl; mix lightly. Spoon over cream cheese layer; sprinkle with remaining nuts. Bake 1 hour 10 min. to 1 hour 15 min or until center is almost set. Run knife around rim of pan to loosen cake; cool before removing rim. Refrigerate cheesecake 4 hours. Savor a serving of this indulgent special-occasion dessert that is perfect for a party. One cheesecake makes enough for 12 servings. For best results, use firm baking apples, such as Granny Smith or McIntosh. Reduce oven temperature to 300ºF if using a dark nonstick springform pan.